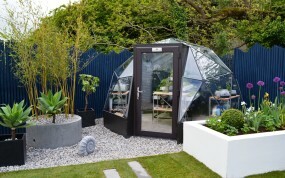 Our glass dome outdoor rooms create a design statement for your grounds whilst delivering a multi-purpose environment for both outdoor living and growing. Geodesic domes have natural strength and aerodynamics. In addition, our domes are constructed from corrosion resistant and rot proof materials meaning that only minimal maintenance is required. They come with 4mm toughened glass, base level ventilation, mechanical window winder units and a secure inward opening conservatory-style door. Mill-finished aluminium is used for the frame and all of our external components are polyester powder-coated, exterior grade aluminium. High quality silicone sealant ensures a weather-tight seal from the elements. 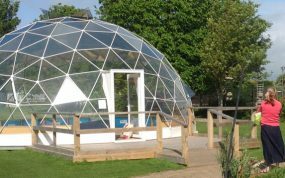 Domes come in white as standard, and have the option to be powder coated in a different colour. For the SOLARDOME® Haven, Retreat and Sanctuary models there is also the option to have an integrated base. 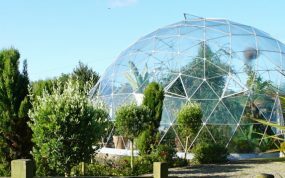 There are five domes in the glasshouse ranging from 3.6m to 10.1m diameter. Prices below are inclusive of VAT and include delivery to UK mainland. 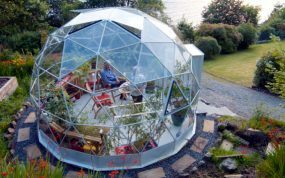 The SOLARDOME® Pod, 3.6m from £8,340*, makes an ideal luxury greenhouse, providing the best possible under glass environment for nurturing and raising plants. The SOLARDOME® Haven, 4.6m from £15,900*, is a lovely, conservatory-sized room providing ample space for a garden sunroom or covering a spa pool. 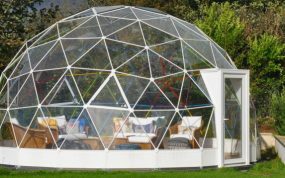 The SOLARDOME® Retreat, 6.3m from £24,600*, provides a large room ideal for a Mediterranean garden, outdoor dining, or for yoga and relaxation. The SOLARDOME® Sanctuary, 8.1m from £30.840*, is a tall dome with enough height for tall citrus trees and palms, creating a tropical gardening oasis on your doorstep. The SOLARDOME® Paradise, 10.1m from £49,998*, is the largest in the glasshouse range and makes a stunning orangery or tropical palm house. It is also an ideal height to accommodate a mezzanine level. 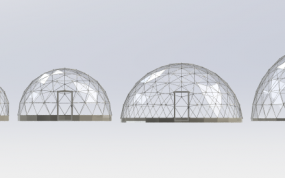 Not sure which dome will suit your needs best? Here is a summary of our single-glazed domes in the Glasshouse Range.